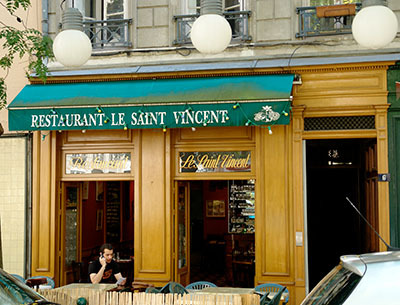 Le Saint Vincent is located on a small square in the heart of Lyon. The restaurant is relatively comfortable. The decor is typical of a traditional bouchon. I highly recommend the terrace that is truly delightful during summer. The service was excellent. Our waiter made genuine efforts to please us. While the last guest arrived after the kitchen closed, they reopened it and cooked solely for him. As starter, I had the brick with Saint Marcellin. 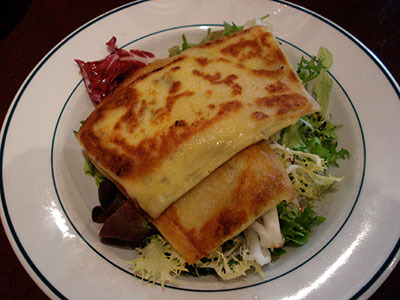 The brick, a thin-layered dough used in north African cuisine, stuffed with Saint Marcellin cheese (a local specialty) was lightly fried and served on salad. 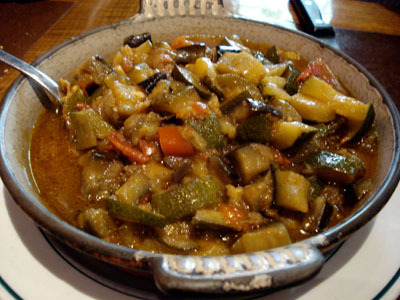 It was a nice and tasty interpretation of the classic north African brick that is usually filled with egg. As main course, I had the duck. 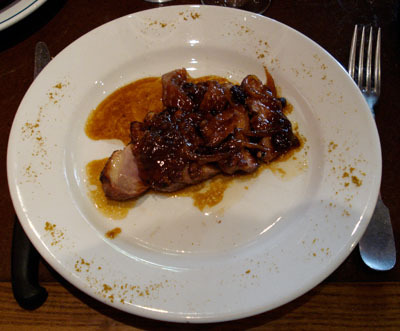 The duck was tender and tasty, cooked with dried fruit and served on the side with ratatouille. While both were really excellent and the association somehow works, I would have preferred something like a potato gratin or steamed green beans with the duck. 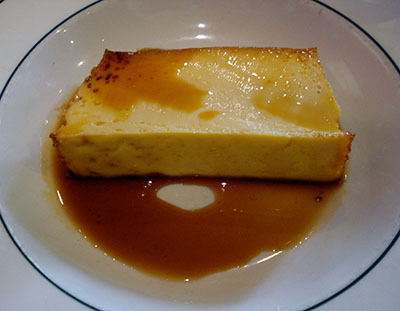 For desert, I had the creme caramel. Classic, simple, delicious and generously served. Around $30, including drinks (a glass of kir and coffee) and tip. Considering the restaurant, the location, the food and the current exchange rate (close to 1.6 dollars for 1 euro at the moment), Le Saint Vincent is a truly excellent value for money. I will definitely come back. I truly agree with Philippe’s opinion about this restaurant. Each time I have to go for a lunch with a client (and especially when heâ€™s a foreigner) I take him to Le Saint Vincent and he is always satisfied and me too because itâ€™s a real traditional bouchon. Itâ€™s a restaurant far from those for tourists that you alas find now everywhere in Lyon with high price and low, or even sometimes, bad quality food.